Hamakor – an Israeli nonprofit for Free Software and Open Code was founded at 2003 and one of its goals is to help deal with money when organizing various activities around Free Software. Before founding Hamakor, people resorted to other solutions. In one exhibition, we wanted to distribute Linux installation CD-ROMs to the crowd. However, we wanted those CD-ROMs to reach only people who have a serious intent to install Linux. A way to ensure it was to require them to donate money in exchange for their CD-ROM. However, if we collect money, we must issue receipts and do bookkeeping. Truly Yours had the brilliant idea of inviting other nonprofits to send a representative to collect the donations and issue receipts. It was a win-win-win solution. We get someone to issue receipts and sweat over the bookkeeping. The nonprofits get money for their operations. The people, who paid for their CD-ROMs, treat them seriously. 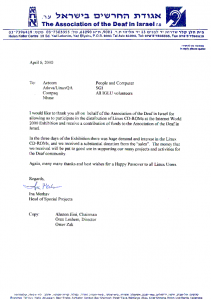 One of the nonprofits was the Association of the Deaf in Israel.